Previous post: Thanksgiving holiday travel (photo): Of course it will fit in the overhead bin! 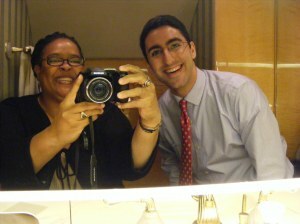 Benet J Wilson and Flightblogger, Jon Ostrower, in the lavatory of a Gulfstream GIV that used to be owned by Oprah. My interview with Benet J Wilson…. Heather Poole: I didn’t; the great Annie “Danger” Scott Riley did. I knew I had found something great, and it deserved a great name, so I asked my fellow Gadling writers if they could come up with something. Annie won. I can’t remember what I almost named it, but it was funny too. AB: How did you come up with the idea to create the laviator blog? HP: It’s not actually a blog, but a club/group that people can join by submitting photos to a Flickr website. I’ll choose some of the photos from time to time to feature on my blog. It all began when I was working on a blog post for my Galley Gossip column on Gadling about trusting your fear (in flight). I needed a photograph of an airplane toilet to go along with a story I was sharing about a man who kept going to the lavatory with a McDonald’s bag. I went to Flickr.com to look for a photo, typed the words, “airplane toilet” into the search engine/tool bar, and VOILA! Hundreds of “laviators” popped up. I couldn’t believe how many photos there were of people posing in the bathroom mirror. Right then and there I KNEW I was on to something. What I loved most about those photos was everyone looked so happy! It was like…they weren’t even on a plane! LOL. And everyone was so different! Young, old, short, tall, and from all over the world. It’s an international phenomenon, I guess. The great thing about air travel is no matter how different we are, we all pretty much have the same experiences – in airplane toilets. HA! It’s why travel is such a great topic of conversation. AB: When was the blog launched? HP: The first laviator post appeared on Gadling March 23, 2009! Wow, the club is almost 3 years old! After I posted the story, a funny thing happened. Strangers started emailing me their photos! So I wrote about it again so I could feature these photos. Soon after that someone named George from Romania created a laviator video (Auntie appears at around 2:23) featuring all the photos. I love that video. And then it just took off! National Geographic even wrote about it! Photos came pouring in. And I would post each one in the Gadling Laviator photo gallery. I saw you on the Travel Channel – God Bless You!